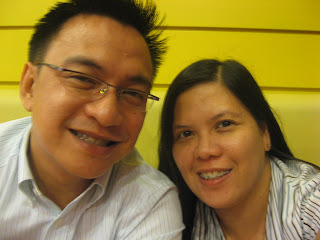 I had a p.m. activity after work last Wednesday and my husband drove all the way to Makati from QC to pick me up. Since it was already late, we decided to eat dinner first before heading home. We decided to go to Dela Rosa Parking lot where there is a haven of restaurants - Teriyaki Boy, Pancake House, Sugarhouse, Kenny Rogers, and much more. 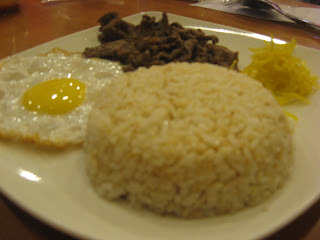 But what caught our attention (and our tummies) is the inviting smell from the Tapa King resto. We haven't had Tapa King in months you see and it was great to be there again. 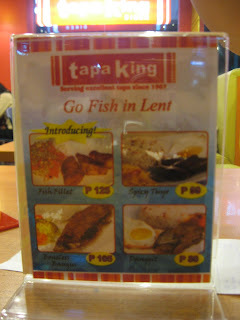 We also found out that they have some Lenten offerings especially good on Fridays when we abstain from meat.